For more details on our work at the international level, read the statements we jointly deliver at these forums. Established in 2007, the Expert Mechanism on the Rights of Indigenous Peoples exists to provide the UN’s Human Rights Council with expertise on the rights of Indigenous peoples. The Expert Mechanism consists of five independent experts, who are appointed for a three-year period and may be re-elected for one additional period. In the selection and appointment process, the Human Rights Council is recommended to give due regard to experts of Indigenous origin. CFSC attends the meetings of the Expert Mechanism, working alongside Indigenous partners and others, to advance Indigenous Peoples’ human rights. Together with our partners we regularly deliver joint statements from the Expert Mechanism. prepare and disseminate information on Indigenous issues. The first meeting of the Permanent Forum was held in May 2002, and yearly two week long sessions take place in New York. 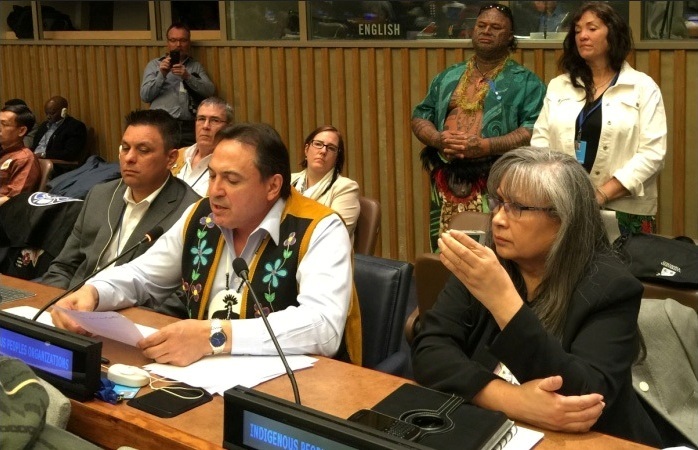 CFSC has attended the Forum since its inception and works with partners to raise issues of concern, particularly as related to the implementation of the UN Declaration on the Rights of Indigenous Peoples and human rights of Indigenous Peoples in Canada. 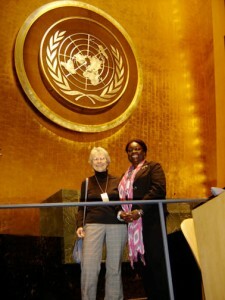 CFSC Associate members Lynne Phillips and Monica Walters-Field in the General Assembly of the UN. CFSC annually attends the Permanent Forum on Indigenous Issues. Photo by Jennifer Preston. Examine ways and means of overcoming existing obstacles to the full and effective protection of the human rights and fundamental freedoms of Indigenous people, in conformity with his/her mandate, and to identify, exchange and promote best practices. gather, request, receive and exchange information and communications from all relevant sources, including Governments, indigenous people and their communities and organizations, on alleged violations of their human rights and fundamental freedoms … [and to] formulate recommendations and proposals on appropriate measures and activities to prevent and remedy violations. The Special Rapporteur also works in close cooperation with the UN Permanent Forum on Indigenous Issues. CFSC follows the work of the Special Rapporteur and, as appropriate, engages with him/her. The Human Rights Council is an inter-governmental body within the UN system made up of 47 States responsible for strengthening the promotion and protection of human rights around the globe. The Council was created by the UN General Assembly on 15 March 2006 with the main purpose of addressing situations of human rights violations and make recommendations on them. 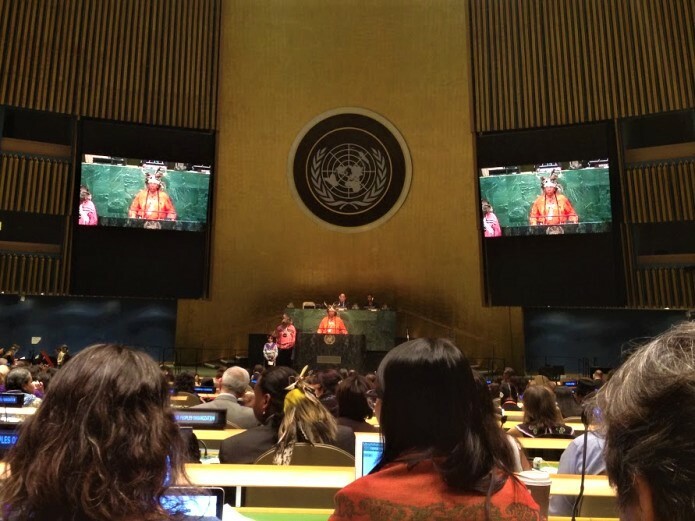 CFSC occasionally attends the meetings, working alongside Indigenous partners and others, to advance Indigenous rights. The Universal Periodic Review (UPR) was created through the UN General Assembly on 15 March 2006. It is a cooperative process which has reviewed the human rights records of every country. The UPR reminds States of their responsibility to fully respect and implement all human rights and fundamental freedoms. The UPR involves a review of the human rights records of all 192 UN Member States once every four years. The UPR provides the opportunity for each State to declare what actions they have taken to improve the human rights situations in their countries and to fulfill their human rights obligations. CFSC works with partners in making joint submissions on Canada’s performance regarding Indigenous Peoples’ human rights to the UPR as well as writing to government regarding our concerns about Canada’s performance. CFSC has added its support to our Indigenous partners’ work on the Nagoya Protocol. In response to a request for input, the Grand Council of the Crees (Eeyou Istchee) submitted comments to WIPO regarding the participation of Indigenous Peoples and respect for their human rights – Note on Existing Mechanisms for Participation of Observers in the Work of the WIPO Intergovernmental Committee on Intellectual Property and Genetic Resources, Traditional Knowledge and Folklore: Comments submitted by the Grand Council of the Crees (Eeyou Istchee).